RPS offers incineration of non-hazardous industrial waste, through an economically feasible and environment-friendly method. Its systems offer the additional advantage of energy/material recovery. As pollution norms get more stringent, RPS systems can safely dispose off industrial waste reducing their threat to the environment and human health. Bio-methanation is a universally accepted technology for bio energy generation from bio waste. It is simple, user friendly & it has no recurring expenses by using this process, fast decomposing waste materials can be treated hygienically. The gas generated through bio-methanation can be utilized as a fuel for power generation. 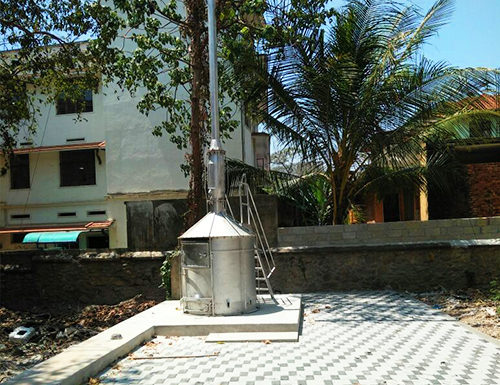 Bio-methanation is a universally accepted technology for bio energy generation from bio-waste. It is simple, user friendly & it has no recurring expenses by using this process, fast decomposing waste materials can be treated hygienically. The gas generated through bio-methanation can be utilized as a fuel for power generation. Many design and technologies are available for waste to energy projects. Most of them are very expensive and high technology involved. 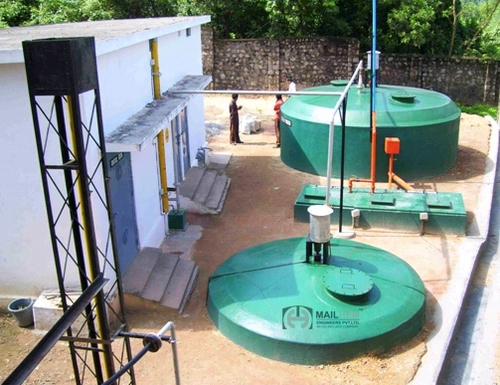 The modified version of Bio- Methanation can be considered as extremely user friendly, eco-friendly and unique waste treatment system. Introduction of pre-digester / reactor. 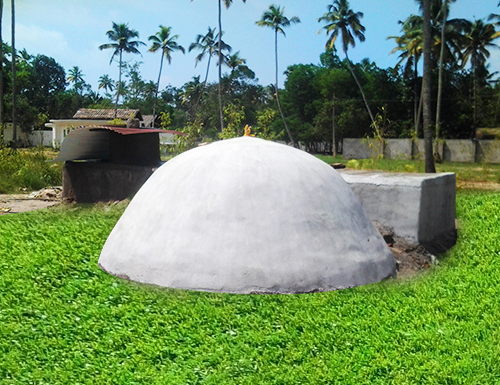 The digester is modified version of fixed dome model & constructed with concrete. To ensure long life & trouble free function assuring durability. It gives equally maintained gas pressure from gas plant to kitchen, using a Compressor. The function of the digester/reactor with culture is to cultivate the microbes in the digester. After the initial feeding the microbes are born in the digester which decomposes the bio waste effectively. Once microbe cultured in the plant it grows and multiples and remains active in the treatment plant. The feed materials are cooked and raw food waste, fruits & vegetables waste, fish and meat waste, waste sludge and used tea dust etc, and all other fast decomposing waste materials and waste water containing bio waste materials. Accumulation of waste & problems associated with negligent handling of waste can be prevented by installing biogas plant. Since waste generated gets treated every day at source; allied problems can be contained. The plant is so designed that it will be free from air contact and hence air pollution and stink will be under control. The slurry formed after treatment of waste can be used as good bio manure. Stock of biomanuare, and ideal soil fertilizer to augment gardening & vegetation. RPS plant helps to avoid the release of methane gas to the atmosphere and prevent global warming and ozone destruction to a great extent. The plant helps to prevent microbial multiplication & spreading of hormonal diseases. Pollution and contamination of water due to dumping of waste can be prevented. The solution helps in overcoming energy crisis. RPS plants are easy to operate and no specific training is required to operate it. We live amidst different type of wastes. This includes toxic organic wastes industrial wastes and house hold garbage wastes. And though we are all well concerned about the health hazards and environmental risks it produces, we throw wastes here and there. In order to save our earth, our water and our air from pollution, we must consider waste disposal much more seriously. Waste Burning System effectively addresses the garbage issues of almost all categories of firms like Hospitals, Auditoriums, Industries, Educational Institutions, Shopping Malls, Flats and Villas, Amusement Parks etc. Public protests are mounting against centralized waste management. Our Waste Burning Systemis capable to dispose large quantity of solid wastes, both wet and dry, to ash within a short time. There is no need of any fuel or electricity for its operation. Fuel free Waste Burning Systemrequires minimum investment for installation and there are absolutely no recurring expenses for fuel or maintenance. There is absolutely no need of any type of fuel or electricity for operation. No running cost or recurring expenditure. No need of technicians to operate the unit. Waste Burning System is thermally insulated. There is no risk of burning, No threat to the surroundings. All most all types of wastes both wet and dry can be disposedexcept toughened glass plaster of Paris, dry batteries and other explosive materials. It is so compact that it can be installed even on roof tops. The onlyrequirement is the availability of sufficient air supply.